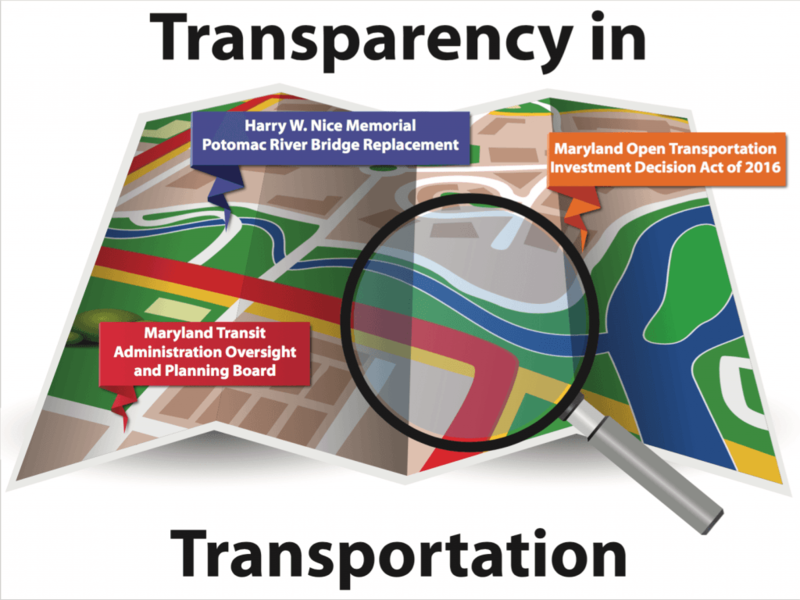 Annapolis, MD – Speaker of the House Michael E. Busch, Senate President Thomas V. Mike Miller, Jr, and legislative leadership today announced common sense legislation to create more transparency and accountability in deciding how Maryland taxpayer dollars are spent on transportation and transit. “People don’t mind paying for road improvements or improved transit as long as the funding goes to reducing congestion and commute times, getting cars off the road, and creating jobs and economic development opportunities. Getting rid of the mystery of how, why and where roads get built in Maryland will only increase citizen confidence in the process.” stated Senate President Thomas V. Mike Miller, Jr. Long-term planning and funding decisions are made by each administration with the input of local jurisdictions but without transparency or objective decision-making process. Virginia recently passed bi-partisan legislation to take the politics out of transportation funding decisions and this bill proposes that Maryland follow a similar process. This legislation would create a new process to objectively screen and rank the priority of transportation projects based on their anticipated benefits including reduced congestion and increasing economic development. Funding lower scoring projects ahead of higher scoring alternatives is not prohibited but doing so requires the Governor to provide a rationale for any deviation. The Maryland Transit Administration (MTA) is the country’s 13th largest transit system with more than 370,000 trips taken each day by the elderly, disabled and school children on bus, light rail, metro subway, and trains. The MTA does not currently engage in long-term planning, and does not produce regular performance and reliability reports for the public. Furthermore, the MTA does not have a mandated, permanent forum for addressing concerns of transit riders, business leaders and the public. The Harry W. Nice Bridge will reach the end of its 75 year life span in 2025. It is a critical evacuation route and the only logical alternative to I-95 across the Potomac River. After a replacement plan was in place, the construction of a bridge is currently stalled, and unless legislative action is taken, the bridge will reach the end of its lifespan without a new bridge being completed. The legislation requires the Maryland Transportation Authority undertake all the necessary steps to begin construction of the Harry Nice Bridge replacement in the near future. As MTA, MARC and DC Metro fares, parking and carpool expenses have increased, the tax credit to businesses offering commuter benefits to their employees has not kept pace. Offering employees commuter benefits has become less and less attractive to the state’s employers. This legislation would double the commuter benefits tax credit from $50 a month to $100 and reduce carpool eligibility from 8 riders to 6 riders to encourage more carpooling.